Metallic Shoes: Appropriate for the Office? What are your opinions on colored shoes for the office, specifically metallics? My first thought would be definitely not. I am thinking in particular of a pair I have that are silver… and they are the reason I am asking. The silver color is the only reason I wouldn’t be able to wear them in a professional setting. Otherwise, they are a conservative heel, closed-toe T-strap and in perfect condition. Darling on! But I wasn’t sure if the silver color would scream “too much!” What do you think? Great question, Reader M! We’ve talked about showing personality at the office, when conservatism should trump fashion, and even metallic shoes before, but not in a while. (Pictured: Kate Spade New York “Licorice Too” Pump, available at Nordstrom for $328). a) I love colored shoes for the office. Personally I’m a huge fan of purple pumps, and I think that stripes and colorful details (like striped heels and contrasting straps) can be fun but also professional. b) That said, you have to realize that shiny metallic shoes — even in a conservative pump — are statement shoes. Some people will like them, and some people really won’t. So for my $.02, you really not only have to know your office but know your situation as well. That is: I would not wear shiny silver or metallic shoes to any big meetings, on interviews, or other Big Events. c) Note that there is a spectrum here. For example: these Cole Haans (on sale at 6pm for $194.99 (was $298)) have bronze accents but are not shiny bronze shoes. I think a muted pewter, or a crackled gray with some silver flecks in it, are much more wearable than an all-silver, shiny shoe. Readers, what are your thoughts? Are shiny metallic shoes so trendy right now that you wouldn’t blink an eye to see them at the office? Or do they fall into the realm of disco/party shoes — acceptable only after work? Update: The Cole Haan pumps with bronze accents have been reduced again, to $164.99! I think it is hard to have an across the board “rule” on this, even within a single office. The spectrum is what makes it complicated. I personally would wear the black heels with metallic accents/heels to work but not the silver ones at the top of the post. My own personal guidelines are that I think shiny metallic accents are fine at my current office and the last one I worked at. I probably wouldn’t wear shiny metallic all over shoes but might wear non-shiny metallic all over shoes, although that would probably depend on the specific pair. I like these shoe’s but would NOT wear them in the office. I have enough issue’s with FRANK lookeing at my boobies and commenteing on my tuchus. This would be terribel if he USED my shoe’s as an execuse to looke up my skirt! FOOEY on that! I do NOT want any man useing MY OWN CLOTHEING (or in this case, shoe’s) to looke up my SKIRT! Now he would NOT see anything much b/c I ALWAYS wear pantie’s, but why give him the chance? He take’s virtueally EVERY oportunity to comment about my body, look at my boobies and my tuchus, and now he would be tryeing to do THIS? NO WAY would I give him this chance. I do not want ANY man lookeing up my skirt. Even Alan never did this cheep trick, I suppose b/c I gave of myself to him, but the rest of the looser’s are NOT goeing to get a cheep thrill through my pump’s — even if they are KATE SPADE, who I love, BTW!!!!! I Mabye would buy these and wear with Jean’s, then, but that would NOT be in the office, KAT! YAY!!!!! Totally agree with Kat’s distinction. While I might not wear silver or gold or bronze shoes to work, the Cole Haans above or pewter are in a different category. I’ve thought about buying the Adrienne Vittadini t-straps in pewter and I would wear them to work. I don’t work in a conservative environment at all (wearing cuffed sandals with studs today) but there’s something about all over metallic shoes that look like c*cktail wear. My initial thought was I wouldn’t wear the silver shoes to work, but I think maybe they’d work peeking out from gray wide leg slacks? I do have a pair of bronze-y Ivanka Trump pumps I wear. This. A little bit of silver showing below a trouser cuff at a conservative office is very different than a really shiny shoe worn with a short skirt even at a more casual office. An all-silver shoe could be fine at work if you play it down & make it look less like a party shoe. But you really have to take the attention away from it. While I love a fashionable touch at work, this type of shoe seems like it would be more effort to style appropriately than it’s worth — I’d rather go with a fun color shoe that is a bit more flexible in the office wardrobe & leave the fully shiny shoe for after work. Yes, I was thinking the same thing about the silver shoes. I would find them more appropriate if they were peeking out from under a pair of trousers rather than worn with a skirt or dress where the whole shoe is visible. It will probably surprise none of you to hear that I love metallic shoes and do indeed wear them to work. I have not-very-shiny gold “reptile”-finish pumps, shiny-ish crackle-finish silver pumps, and ivory pumps with non-shiny bronze trim. Love ’em all and feel like I am able to make them look businessy and not c*cktaily for the office. Oh, and I would totally wear those gorgeous silver Kate Spades to work. I wonder if I have the same gold crackly pumps? Kate Spade? They are actually surprisingly neutral looking, especially with my skin tone. I wear them during the summer, primarily. At least one other associate at my NY law firm has them too and we laugh when we see each other wearing them. I am wearing pewter shoes right now, but a business casual environment allows for plenty of leeway. I’m on Team Pewter. Pewter and bronze, no problem. Super shiny silver or gold? Iffy. I do have some gold flats and I have worn them to work before, but they can definitely feel a little too party-shoe. I have no such qualms about my pewter ones. I’m a little confused by the distinction between pewter and silver – thoughts on whether these shoes would be office-appropriate? Much less bright and shiny than silver. I actually think shopaholic’s shoes are pewter, not silver, but the straps makes them too evening for me for work. I think even in black it might be too evening. And I think NOLAs read more gunmetal than pewter. But some of the difference is also the finish of the shoe — flat leather vs patent. Shopaholic: those look more evening to me, but I think that’s the straps and color combination. I don’t think the cut of those is office appropriate, they read cocktail to me. I think the color might be ok in at least some offices, but in a more conservative style. All over gold: probably not. I have a pair of champagne/rose gold colored flats from Saks that are pretty subtle and I would consider wearing to certain clients and not others. Definitely okay for Fridays. They are muted and not very shiny. Those silver pumps in the picture: no way never. I like little doses of metallic – like just a strap or other detail. That being said, you’re right about every situation being different! I vote no on metallic shoes at all in most offices, but this is based on my own experience. One snow day, I wore boots to the office and brought my gold TB Revas to change into (because of the snow, it was a casual day). I got more comments on my shoes that day – some positive, some not. It was just too much attention over my shoes for me to be comfortable with. So while I love colored shoes, I won’t do metallic again. I wore patent navy hidden platform shoes yesterday (with navy tights and a grey skirt – we’re going into Winter down here!) similar to these: http://www.dsw.com/shoe/bandolino+envia+patent+pump?prodId=dsw12prod3810047 (but in navy) and got several comments from my co-workers (all positive). I’ve worn the shoes in the past, don’t know what was different yesterday, but can’t wait to use them again. On topic, I am trying to get my hands on peweter and muted gold pumps, so that I can STOP WITH THE BLACK SHOES ALREADY (sorry for the ELLEN CAPS). I would wear those silver Kate Spades if I wanted to, but we are the casual side of business casual and can get away with a lot. I have pewter Air Tali wedges. Def appropriate. I also have silver-gray-crackle Nine West ballet flats and the same in gold/bronze-crackle, which I wear all the time. I think not the super shiny silver ones, though. I have quite big feet so I think shiny metallic shoes are the opposite of what I would want, to be honest. Also they might be better if you drive as opposed to walk, since I can imagine they would show dust and dirt very obviously. Amazon has the cole haan’s picture for $137 in lots of sizes and several colors! Just ordered mine and so excited – I’ve been coveting them since I saw them full price. Hope they fit; I have trouble with Cole Haan sizing, but these are adorable and definitely office appropriate unless it’s a court or the equivalent day, in my opinion. I definitely wear shiny shoes or shoes with bright prints to work. It helps to time them down with a conservative dress or jacket/skirt. …. I have worn bright metallic green faux croc boots to the office, so I have to say it is definitely a Know Your Office thing. I wouldn’t hesitate wearing something like that bronze pair to most offices, but the upper would for me be too in-your-face shiny for work – but if someone can pull it off, more power to them. 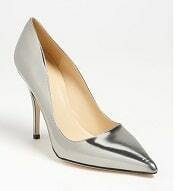 I have silver pumps very similar to those posted and wear them frequently at work. I probably would not wear them for trial but do wear them for other court appearances. No, no, no – NOT for the office. I was at an event where Nancy Pelosi wore silver shoes just like the ones at the top of the post, and she looked perfect. I found a photo from another event – will post link separately to avoid moderation.